Houses across the UK have typically increased in value by around £90 per day, during the first six months of 2014 as the housing market gains momentum, it has been reported by property website Zoopla.co.uk. Those lucky enough to own a home in the capital have seen their London properties values climb by an astonishing £238 a day, whilst their Scottish counterparts have witnessed a much less sizeable £10 daily increase in values, according to the research conducted by Zoopla. The average property price in Britain currently stands at £260,488, which is a £16,265 in cash or 6.5 per cent increase over values in January this year, equalling a £90 per day increase over the first six months of the year, the research confirmed. Despite partial market recovery, some homeowners have also seen the values of their homes dwindle since January. The town of Wadebridge in Cornwall was named by Zoopla as the worst performing town over the six months for property prices, with values having fallen by approximately £40 per day, more than £7000 over the entire six month period since January. The City of Salford in Greater Manchester has witnessed house prices soar at a quicker rate in percentage terms than any other urban area of Britain in the first six months of this year, with a 12 per cent value increase in the period according to the Zoopla report. Property prices in Salford, which is now home to the massively successful MediaCityUK complex where much of the BBC is now housed, have grown by nearly £15,000 over the last six months to reach an average house price of £138,619, up from £123,745. 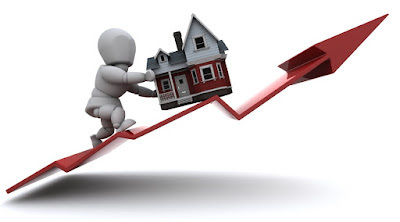 London house prices have grown at a lower percentage rate than their Salford counterparts, with an 8.2 per cent increase recorded in the capital over the last six months, but in cash terms, the increase is much larger than in the north-west city, at £43,115 over the whole six-month period, or £238 a day, raising the price of an average property in the area to £567,392. All of Britain’s regions have seen prices rise through the last six months, with London’s upswing followed by a 7.5 per cent or £19,440 increase in property values in the East of England over the last half year, equating to a £107 per say rise in the typical property value in the region. A spokesman from Zoopla, Lawrence Hall, said: “Over the past few years, Salford especially has prospered from job creation in the area, which has helped to boost the local property market. Whilst the housing market is, in general, showing signs of strengthening, some recent reports have suggested that the pace of recovery is slowing, particularly following the introduction of toughened mortgage lending rules at the end of April, meaning applicants have to undergo stronger checks into spending habits in order to ensure they can afford the loans on offer.